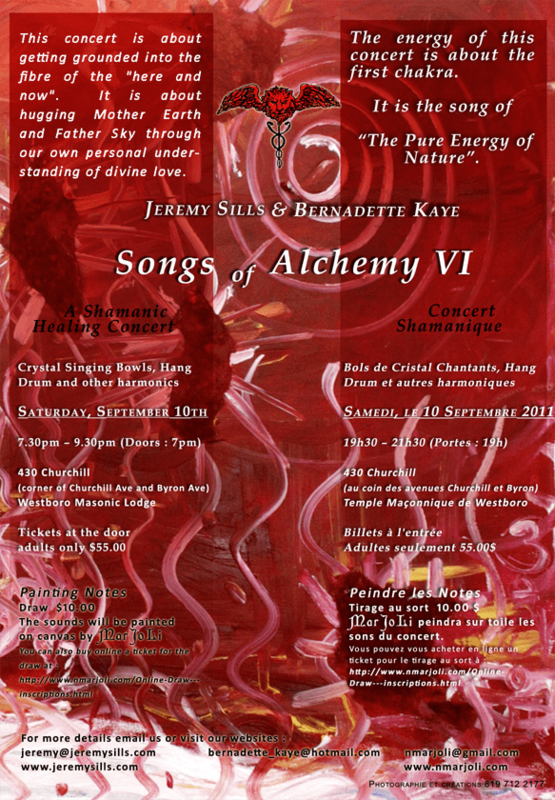 This is to let you know that Jeremy Sills and I will be giving a concert on Saturday, September 10th. The first Chakra will be the focus and vibration of the evening. The first Chakra is also called the root Chakra because it is about being grounded to life like a tree to the earth. It is about being “here and now”. Without its roots, the tree cannot stand tall, nor can it bend to the winds of life, the heat of the sun or the rain or tears. Strong roots make a strong life. The root chakra is also anything that helps the grounding of life, such as money, home and family life. This is about the clan you belong to and how you identify yourself: “I am Canadian”, “my family drives me crazy”, “I am a computer programmer”, are all first Chakra identifiers because they make you feel like you “belong” . So, if you have concerns about money, or concerns about going home for Christmas because your family still has the power to push your buttons, or concerns about whether your family approves of your choices or not (the dreaded “shoulds”), then this concert is for you. This is about being secure in who you are because you believe in yourself and because your roots are your own. This is about being free of the judgement of others. How easily we forget that the Earth holds us all with love. May we all remember that we are here, now for a loving reason and that, for this reason alone, we can safely and openly embrace the world we live in. This is the song of the root Chakra. The concert will be at the Masonic Temple at the corner of Churchill and Byron. Cost is 55$ . We start at 7:30 and doors open at 7:00. Bring pillows, blankets to make you feel as comfortable as you wish.